The ancient capital and port city of the island of Lesbos, Mytilene, is located in the Aegean Sea. Home to some of the most influential poets, philosophers and artists, Mytilene is a city brimming with history, flavour and gorgeous scenery. The city’s golden beaches, resilient fortresses and bustling street life are what attract tourists to this picturesque city. Cheap flights to Mytilene are now available for a limited time only, so book your flight today and prepare to be swept up by the ancient charm and picturesque scenery of this Mediterranean city! Mytilene is home to Mytilene International Airport (MJT), a 15-minute drive from the city centre. Explore the ancient ruins of the medieval fortress, built on the pinnacle of the peninsula, while the Statue of Liberty and Church of Agios Therapon stand testament to the local artisans of the time. 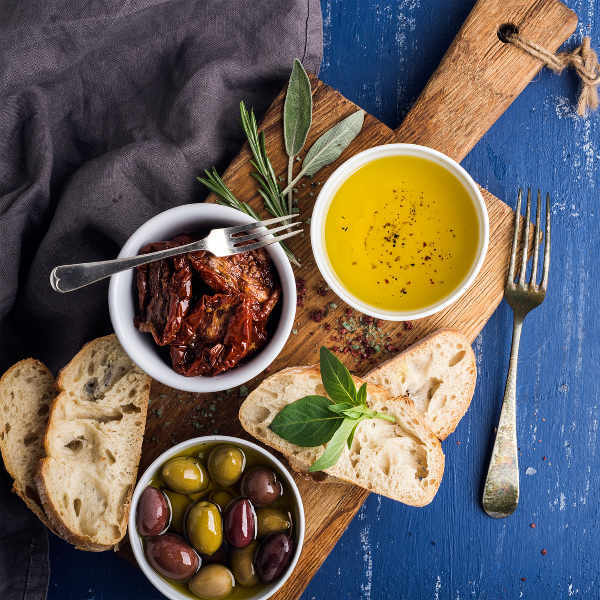 With taverns and bars spilling out onto the streets of the old town and waterfront, you’ll be spoilt for choice with the freshly-prepared cuisine on offer, best washed down with the local wine and ouzo. Savour the post-card views while meandering through the rustic villages and interesting neighbourhoods of Turkish houses, overlooking the ancient harbour; or opt for the beach towns of Molyvos and Skala Eressos. Mytilene experiences a typical Mediterranean climate, with the summer months of July and August being more favourable for those in search of a beach getaway. The winter season, between November and February, brings slightly more rainfall, though the city does not get especially cold. 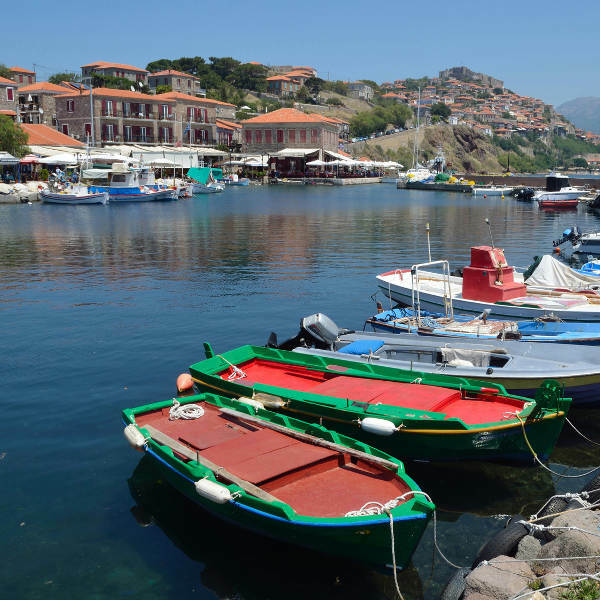 The highlight of Mytilene is walking through the quaint, historic streets, perusing the shops and eateries along the way to fascinating museums – all before relaxing on the sandy beaches. For this reason, pack in your sunhat and sunglasses and explore the city during the hot summer! This capital city of the Greek Island of Lesbos is one of the oldest cities in the world, with a vast history dating back to the 11th century BC. Mytilene is the birthplace of many legendary poets, including Alcaeus, Sappho and Odysseas, and has been home to Aristotle, Epicurus and the famous painter, Theophilos. The city has preserved its culture while paving the way for modernisation. The horseshoe-shaped inner harbour serves ferries to nearby islands as well as important mainland cities like Piraeus and Athens. With such a rich, dynamic history, there are many ancient sites, castles and museums to explore. 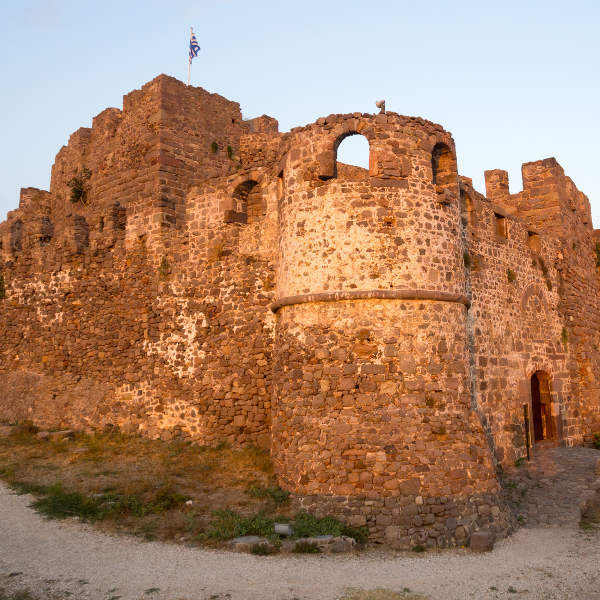 The grand castle of Mytilene Fort, built in the 6th century is a must-see, offering picturesque views of the ocean and shoreline. The Archaeological Museum houses a collection of excavated exhibits, reminiscent of neo-classical architecture. The Theophilos Museum, enveloped by a silver olive garden, showcases the works of folk painter, Theophilos Hatzimihail. Don’t miss the Yeni Tzami Mosque, Turkish baths and the grand theatre on your tour. The waterfront is lined with markets humming with locals and tourists sipping on espressos at the café-bars. Step back in time as you walk along Ermou Street, where the antique shops, ouzo factories and charming taverns draw you in. Compare several airlines and book your cheap flights to Mytilene online at Travelstart! The island of Lesbos is considered to be very safe as tourism accounts for most of the island’s income. Locals are friendly and go out of their way to assist you. The island has experienced an influx of refugees since 2015, but do not let this deter you from exploring the beautiful city of Mytilene. Though visitors may need to be extra cautious with personal belongings, violent crime on the island is almost unheard of.